My Top 5 series of books has proved very popular. The first post titled Top 5 books for Enterprise Architecture was the blogs most popular post in August. 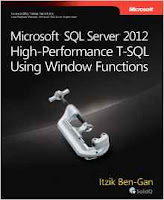 My post last week about my Top 5 SQL Server Books for the DBA has also been well received. This week's post is the Top 5 Books for the Database Developer, again these are the books on my physical and virtual bookshelf. Thanks to Steve Hindmarsh for his comments. Steve recommends the following books. I have read the Antipatterns book a while ago...although i don't still have a copy. It is a good book. Defensive Database Programming - By Alex Kuznetsov. Thanks for the comment Steve, I have read both of this and I think both are worth a mention so I have updated the post to include them. Thanks Gethyn. I think it is great to see my book on this list. oh and BTW, it would be good to list Wayne Sheffield as the co-author of the recipes book. Thanks Jason I have added Wayne as an author too. Should I add anyone else?